Mi casa es su casa – my home is your home – an expression usually associated with our neighboring Latin countries is one that can be applied to Turkey as we discovered in our travels. Although many Westerners view Turkey as an Islamic Middle Eastern country there is a secular presence and a European influence, which brings together multiple cultures and practices. Our travels to Turkey brought us to the thriving city of Istanbul, the wonders of Cappadocia, and the relaxing beauty of Kusadasi just to name a few areas. 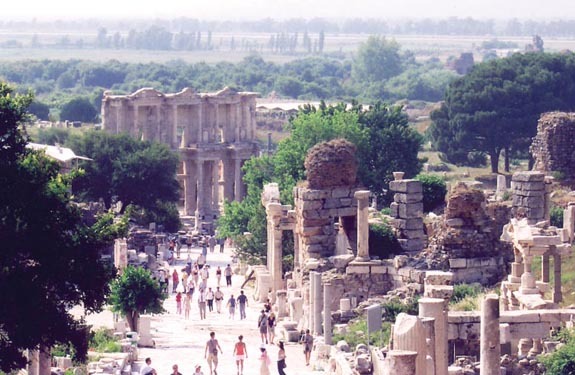 The historical and archeological sites are far from the only attraction in Turkey. The restaurants, shopping and most importantly the people furthered our enjoyment on this trip. 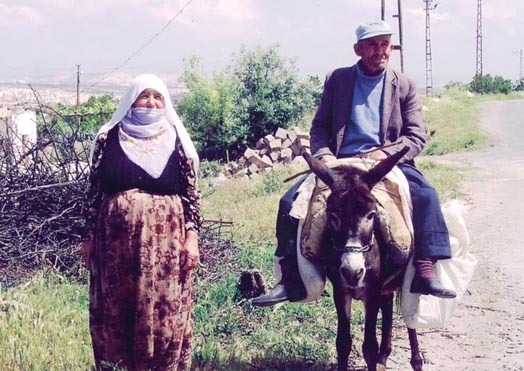 We were all in awe of the kindness and eagerness of the natives and soon you will learn about it too on your trip because Turkey is a country not to be missed. As Turkey is a diverse nation with much to offer a stay of two weeks is suggested. To make your trip the most meaningful it is recommended that you contact a travel company that specializes in Turkey. One of them that the Turkish Tourism Office mentioned to us was Credo Tours, Travel and Yachting. We spoke with Sirma Gulgul and found her input on itinerary and hotels in order for us to reach the destinations most important to us to be most helpful. She even arranged for a private minivan and driver to take us to the more remote locations. Her company was professional and reliable and surprisingly affordable. Visit them at www.Credotours.com. There are many good restaurants to enjoy in Istanbul – quickly one becomes familiar with baklava and Chai tea (the Turkish tea of choice) as many Turks enjoy these items following a filling meal. If you are anything like us by the end of your stay in Turkey you will become experts in discerning which place has the best baklava or Chai tea – the tea is also available in an apple flavor for those unable to tolerate caffeine – Elma Chai. In Istanbul there are many places to visit such as Hagia Sophia, the Blue Mosque, the Bosphorus Strait, the Grand Bazaar, and the Spice Bazaar – at these places we were fortunate to spend our days enjoying Turkey’s history while purchasing evil eye trinkets, spices, Turkish delight candies, leather jackets, and much more. During these day excursions it is imperative that tourists carry a good amount of bottled water, especially in the summer months. In front of the Blue Mosque are a number of obelisks, which have come from different areas and contain scenes carved into the material depicting different social scenes. One monument in particular was 3500 years old composed of granite from Egypt, standing 20 meters tall. Some of these artifacts come from the Byzantine Empire, which we heard a lot about while visiting the ruins of Turkey. Our tour guide even remarked to us that unbeknownst to many tourists Turkey has more Roman and Greek ruins than the countries of Greece and Italy respectively. Many guide books suggested that women bring scarves with them for the religious sites, but as we found when entering the Blue Mosque it is not open to tourists during prayer and thus head coverings are not necessary. One religious practice that was very fascinating was the fanfare leading up to the circumcision of young boys. Unlike in the Jewish religion where boys are circumcised at 8 days old these boys are circumcised at around the age of 7 and 8 years old. For them and their families the celebration leading up to it is a very big deal – they are paraded around the city dressed in elaborately adorned garments and receive many gifts commemorating this spiritual journey. Keep an eye out for these boys – it is an intriguing site. Hagia Sophia is older than the Blue Mosque, which was built about two hundred years later and faces it. 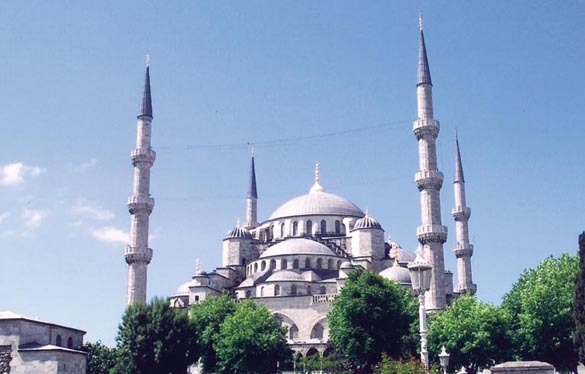 Sultan Ahmed actually ordered the building of the mosque – when he was a young leader. The history of Hagia Sophia is equally interesting; it was originally built as a church in the 6th Century and then later converted to a mosque. Symbols were added to the church to make it representative of the Islamic faith. Hagia Sophia has four minarets where the Blue Mosque has six. Interestingly, funerals are conducted outside the mosque so as not to “dirty” it. In the Blue Mosque there are special blue tiles at the gallery level. These tiles were deemed to be very valuable and rare in centuries past. They are known by the name of Iznik tiles and many stores selling pottery will have bowls and plates echoing these ancient tiles. The construction of St. Sophia was very different from the Blue Mosque – its construction was ordered by Constantine. It was built during the years of 532-537 A.C.E., roughly 10,000 slaves worked on the Basilica, which was dedicated to Jesus. Many of the ruins in Turkey represent the diverse religious groups that once occupied its land during the various eras. When the Turks came through and converted the church to a mosque they added the minarets and flying buttresses for structural support. Once we walked out of the St. Sophia we were greeted by open green fields with beautiful gardens and in the distance is the Blue Mosque – a picture worthy panorama. One important culture-shopping fact worth mentioning are the Turkish rugs. There are many varieties of rugs – cotton on cotton, silk on silk, wool on cotton – the trick is that the more knots per square inch the greater the detail in the rug. Be forewarned that the greater the detail in the rug the more expensive the rug will be. We found that the silk on silk rugs were like paintings; the detail afforded by the delicacy of this thread is amazing. For those tourists with children, or who are interested in royal families – we believe you should stop at the Topkapi Palace. There visitors will be transported back in time when viewing the dishes used and kaftans worn by Sultans. Some of the kaftans are gargantuan while others appeared miniscule representing the different rulers and family members. At the southern part of the old city lies the Sea of Marmara, which is why Topkapi was built in this location as it allowed the sultans to keep a watchful eye on the city and preserve its security. Outside the palace lie many fountains, which was very picturesque. There are three gates – the first is known as the Imperial gate. Above this gate is a plaque with the signature of the sultan who built Topkapi. The palace was closed and then later reopened in 1925 as a museum – it stands about twice as big as the Vatican and about half the size of the Monte Carlo. In fact at one point there was a coin mint during the Ottoman Empire located within the Palace gates. Just as the first gate marked the public area, the second gate marked the private area and the third marked the most formal area where the Sultans roamed. The second gate is known as the Gate of Salutations – from there the Sultan would stand and salute the population. Attached to this gate is a prison; usually prisoners were kept at the prison for a few days before they were executed. The pillars outside this gate at times held the heads of prisoners to stand as a reminder to the common people. The third gate known as the Gate of Happiness is more of a ceremonial area. Upon entering the third courtyard there are rooms upon rooms of costumes, jewelry, china and other porcelain goods. Some of the dishes on display are from the Yuan dynasty and Ming dynasty. Many of the wares and items were the spoils of war as ordered by the sultans. Other things like the velvet came from Spain and Venice, but the silk was native to Turkey. After touring around the Palace one’s own appetite for wares and goods will have been whetted. Therefore, we walked to the Grand Bazaar and the close by Spice Bazaar afterwards so that we could find ways to spend our Turkish Lire. One warning is that the Grand Bazaar has about 4,000 shops so it is important to get a sense of its layout before shopping – knowing what to look for beforehand will help visitors find the best price for their gifts of choice. 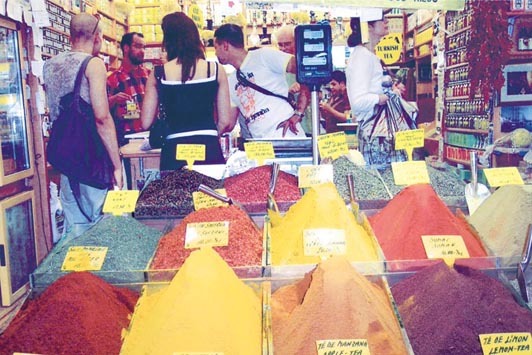 At the Grand Bazaar – one may indulge in jewelry, t-shirts, leather goods, beads to make jewelry, backgammon sets, and evil eye bracelets (which friends in the US will adore). There were many store owners who offered us Chai tea as we looked at their products. One item that many travelers associate with Turkey is meerschaum pipes and statues – the carvings are beautiful. These stores should be visited while in the Grand Bazaar. We were extremely fortunate to be recommended to Mustafa Ciplak of Sardunya Travel who arranged for our local tours around Istanbul and provided his invaluable personal attention. He is the consummate professional – friendly, available, detail oriented, knowledgeable and filled with recommendations for places to dine or make important purchases. He can be reached at www.toursturkey.com. After enjoying the pace of Istanbul we were off to Pamukkale, a quieter more remote region. Pamukkale is known for its mineral ponds and its thermal springs. There are of course ruins there too, but the highlights of this region are most certainly the natural resources. We urge you to walk around these mineral ponds – they feel great. Shoes must be taken off as they can damage the limestone deposits. Although the flow of the water has been restricted in some areas tourists can still walk through many ponds. One must walk with care and if possible we recommend water socks to protect one’s feet against some of the pebbles on the walkway. However, once in the ponds it feels wonderful, almost like a facial on one’s feet. The sand is filled with minerals and feels warm and soothing. Close by are the thermal springs – those with pace makers or heart conditions must be careful when spending time in the springs. The water is very hot and it can be too much for certain individuals for extended periods of time. Once we finished our site seeing for the day we returned to the comforts of our hotel – Lycus River. Overall the quality of the facilities at this hotel is very high. The pool is another attraction; it is large enough to enjoy some laps under the warm Turkish sun (especially during the summer). But the greatest draw to the Lycus is the wonderful dinner buffet. There, we enjoyed native Turkey dishes made from lamb and chicken, salad, eggplant and sumptuous desserts. Following Pamukkale our travels took us to Kusadasi – unlike Istanbul this city is very relaxed, more along the lines of Pamukkale, and has many resort areas for one to enjoy some leisurely walks. On our way to Kusadasi we visited an onyx factory – many display items and chess sets are made from this material and it comes in green, white, brown and black. As the black is not as valuable it is often found in jewelry. Brown is the easiest to work with therefore any items made from this type of onyx is the cheapest, but can still make great gifts. There are many factories one can visit, but usually the prices are not any better than the stores you will find in the city so we advocate passing on some of these unnecessary stops if possible. We stayed at the Hotel Kismet, a beautiful hotel with great amenities, located right on the water. The rooms are beautifully furnished; our suite had two bathrooms, and a terrace which overlooked the Aegean Sea. The buffet breakfasts were spectacular – with many excellent choices and enticing desserts. A major attraction while in Kusadasi is Ephesus – a place that can only be truly enjoyed with an expert guide – we strongly recommend Sezgin Demirci of Sardunya Travel [www.ephesustours.com]. He is very laid back and knowledgeable – his descriptions made it easy to visualize the homes, shops and people that once walked the streets of Ephesus. The area surrounding Ephesus changed hands many times over the centuries. Originally, it was chosen as the location for the ancient city because it was right on the water and had a very active port. During the Roman period Ephesus became the capital of the Asia Minor area – at that time about 250,000 people lived in the area. Now all that stands where this great civilization lived are the ruins. There among the ruins withstanding the harshness of the weather and years stand a large library, multi-color pillars and mosaics where the shops once were. Some of the ruins are the shells of temples commemorating goddesses like Artemis – the goddess of the hunt. Although smaller than Istanbul this city has much to offer – there are beaches and walk ways that travelers can take advantage of when wanting to rest and take it easy. An area off the beaten path that we were fortunate enough to enjoy is known as the “Valley of the Cherries” – there we found one of the best restaurants where the appetizers, wine and fruit are irresistible. It is about 30 minutes from Kusadasi but worth the trip. This gourmet restaurant that is a favorite of the locals is Kirazli Koy Sofrasi [www.koysofrasi.com]. Some of the popular appetizers were those that included eggplant and ones that were yogurt based including dill or garlic. These accompanied the delicious homemade Turkish bread. In fact in this small village, Sezgin and his partner Mustafa are completing an amazing boutique hotel that will allow a select number of guests the rare opportunity to see what a real Turkish village experience can be like and do it in style. Between the restaurant, the hotel and special excursions , this promises to give you a taste of Turkey to savor for quite some time. Another restaurant where the food is served directly out of the family’s home kitchen sits right outside the ruins of one of the earliest banks of Ephesus – as night surrounded us we saw the moonlight glimmer off the ruins while enjoying a very satisfying local Turkish meal. When the weather is pleasant it is hard to match the atmosphere, and if you are lucky, the company. The name of this find is XXXXXXXXXXXXXXXX. However, in order to relax in the lap of luxury and enjoy boat rides to the Greek islands a stop over in Bodrum is warranted. We stayed at the fabulous Marmara Bodrum – enjoying the panoramic views, spa treatments, amazing food, and a fully equipped gym. This hotel deserves its five star rating boasting wonderful accommodations, private terraces and patios where a glass of wine can be enjoyed. The Marmara at times plays host to the princess of Saudi Arabia. There is one room that guests can book, which has a private terrace and DVD player with a selection of the DVD’s. One can arrange a selection of appetizers and drinks to be served to guests they are hosting should one book this room. There is no description that can do the hotel justice. Having said that, we would be remiss if we did not mention the beautiful pool guests can enjoy, the lap pool for exercise, the racquetball courts, tennis courts, the lavish breakfast spread (including homemade muffins and pastries some with delectable chocolate), and the spa. We did partake in certain spa treatments like foot massages, Hopi ear treatment, Turkish baths and the flotation tank. At night some of us ventured downtown to the night clubs where every visitor can find the right place for them. These clubs and bars are opened until the wee hours of the morning. The nightlife in Bodrum allows those true shopaholics to enjoy themselves during the evenings and night as well. However, we caution you to be careful because many of the goods found in Bodrum can be obtained for cheaper in Cappadocia. There are boat rides during the day – private ones can be chartered for a reasonable price – to some of the Greek isles. Although the Marmara Bodrum was hard to leave we forced ourselves to continue our travels to Cappadocia - a city like no other. 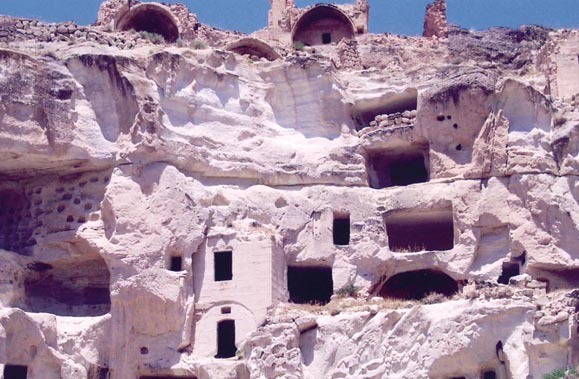 The topography found in Cappadocia is only part of its many charms. Each city in Turkey has places where one can enjoy a Turkish bath – something everyone should partake in while traveling in Turkey. In the downtown one can find an ancient bath hall. Historically, this region of Cappadocia used to house twelve volcanoes – in fact much of the surrounding topography is the result of volcanic explosions in centuries past. A guide is a requirement because the history and stories of the region cannot be well depicted in a book. Our guide Sami Yilmaz, of Credo Tours, was native to the area. and knew the “old wives tales” about some of the resulting landscapes. Sami is funny, adventurous, a wealth of knowledge and knows the area like the back of his hand, including places where the locals bake fresh bread. He knew the “old wives tales” about some of the resulting landscapes. One of the last eruptions was about 3,000 years ago where the volcanic ash filled what used to be a lake. The area still has three active volcanoes, but there haven’t been any eruptions in recent years. The different layers found in the landscaping represent different sediments from the various ancient explosions. 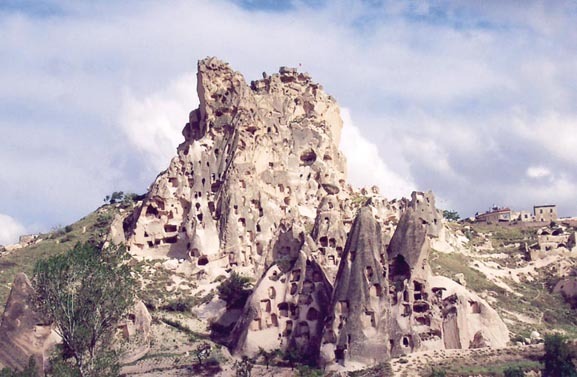 Another area in this region is known as Goreme. Goreme was an area that was very important for Christians during the 1st C B.C.E. The Christians who lived there were looking for a place where they could procreate in safety and live off the land. They built their cave dwellings into the stone. Many of their caves were connected and unseen from the outside – allowing them to hide from enemy forces. One of the benefits from cave living was that the temperature was pretty cool and stayed at a fairly constant level so that they were able to store their crops for long periods of time – like wheat, grapes, pumpkin, sunflowers and potatoes. The national park in Goreme has many different herbs and plants such as thyme, asparagus, and lavender. 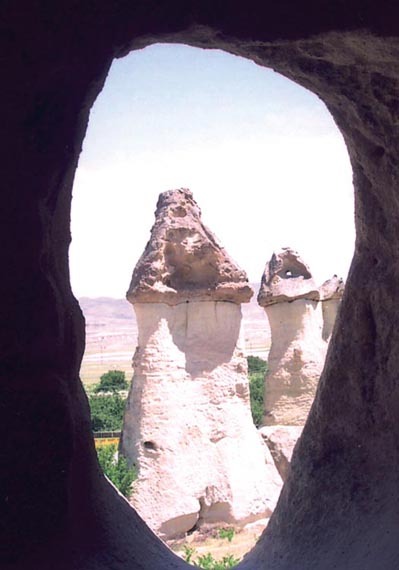 There are a number of areas like Goreme where people can walk through ancient caves – some of the sites within the area cover underground cities, which also hosted persecuted civilizations. These cities in some instances go down about 30+ meters underground. Those persons over 6 feet tall should proceed with caution because parts of these cities are very narrow and low. The citizens of these cities moved out during time of peace so there are only the shells of what were once interconnected cities. Sammy described these cities to us in such detail that we could almost imagine what it would have been like to live there. We could sense the lack of privacy, the group dinners and the development of the defensive strategic plans necessary to protect against enemies. There are also churches that have been built in the caves where one can view frescoes demonstrating the different religious influences throughout the centuries. Similar to the other cities, dining was a great pastime in Cappadocia. One thing one must eat is the Teste Kebab – this is chicken or lamb that is cooked in a clay pot at a high temperature. If you are lucky you will get to crack open the clay pot – thus savoring the sweet aroma of the meal. Many of us were able to try the lamb version; it was so soft and tender. Out of all the cities in Turkey Cappadocia is the most unique when compared to other cities in other countries and great efforts should be made to visit. We must confess that most of one’s shopping should be done in Cappadocia – the best native gifts can be found there. No matter where we went we enjoyed the hospitality of many locals. This couldn’t have been truer than when we visited Ulas. Although we had a personal connection to the area as Hank had been in the Peace Corps there forty years ago the excitement surrounding our visit was positively overwhelming. Here, people with little means offered us tea, beverages and invited us to lunch. Granted this area is very remote and many Turkish people do not even know where it is – the warmth with which we were greeted was hard to believe. We toured the town, visited the main street where once stood six stores now stood twenty or more. Even children who didn’t know who we were demonstrated their enthusiasm at meeting Americans. Although we didn’t speak Turkish (Hank does) we were able to engage in basic hand gesture conversations with these youngsters. The most inspiring part of this trip was that it opened ones eyes to different lifestyles – here, some people lived in makeshifts homes and struggled to make ends meet, but still smiled and greeted us enthusiastically. Recognizably this was a unique experience, but the hospitality we encountered left a memorable impression. Turkey has many sea sides, beaches, cities, historical ruins, archeological finds, and religious sites. One can choose to enjoy boutique, three, four and five star hotels and travel by boat to the Greek isles or visit the excavated sites like Ephesus or dine at the wonderful restaurants and shop at the exciting stores. However, if you are anything like us you will do all of the above. The two weeks spent in Turkey were some of the most educational and relaxing weeks one can spend abroad. Turkey offers the perfect blend of culture, dining, and history. The Turkey we visited is very different than the Turkey we read about in Western papers – here, east meets west. The whirling dervishes are a group of individuals who have the ability to meditate and move in a pattern that would make most of us dizzy. While the dervishes are local to Konya we were fortunate and able to see them in Cappadocia. 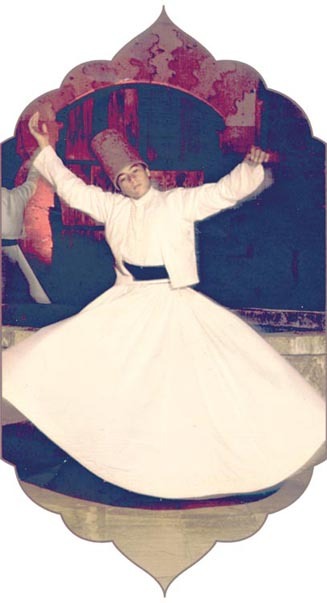 Although the dervishes we saw were Turkish and hence Muslim Whirling Dervishes can be any religion - they are not a sect of Islam. Part of the intrigue surrounding their practices is their wardrobe. The Whirling Dervishes wear a black robe initially, which is to demonstrate respect to the creator – it represents earth. In the beginning of the ceremony they lean forward kissing the ground commemorating their origins. Additionally, they wear a hat, which stands fairly tall and flat on top. The hat echoes a gravestone to represent the cycle of life. Underneath the black robe is a white outfit, which is supposed to represent the spirit of the person. Throughout the ceremony they position their hands in a certain way – representing one. During an interview with the leader of the Whirling Dervishes we were able to broaden our understanding of their customs. Part of the ceremony consists of the leader chanting meditations – the turning is supposed to convey the start to finish of mankind. One starts and returns to earth. As it was explained to us the founder of this religious group searched throughout the land for G-d. Finally, he turned within himself and found the Creator. From his perspective every part of life is turning for them it is the only way they can reach G-d – the reason why they proceed in the meditative process. As the history goes the founder twirled for 72 hours and did not sleep or ate demonstrating the commitment to his meditation. 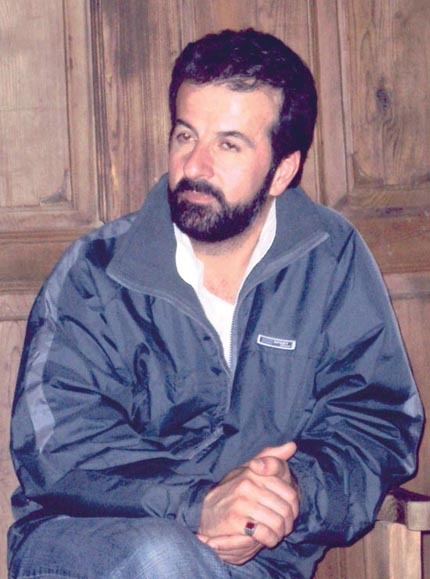 The leader told us that one of the youngest dervishes was 15 years old – he is the leader’s son in this group. First, individuals looking to become Whirling Dervishes are taught the physical movement. Usually after 18 years of age they are taught the spiritual part – there is a specific type of concentration required in order to properly conduct the twirling. There is no age limit to when one can twirl. As the leader is a devout Muslim he still prays five times a day, but he also meditates to purify his soul and to be closer to the Creator. While the twirling is spiritual it is not necessarily religious in the conventional sense. Instead, it is a way for one to be close to G-d. The leader described to us his breadth of different emotions how one feels pain, difficulties in life – the only way to purge these burdens was to twirl. In order to appreciate good one must know bad as described by the leader. Often he mentioned Sufism; it is a way of life not about religion. It is more about the Creator and meditation not looking at an after life or a paradise. Women can be Whirling Dervishes too, but there are separate meditations for the different genders. The positioning of the hands during the twirling represent one hand up over the heart, take from G-d through one’s heart, and then the other hand faces downward toward the ground, returning it to earth. Although there are eyes appear closed they are only partially closed; it is hard to imagine how even with partially opened eyes one can twirl as fast as they do and move through each other. Being a Whirling Dervish does not preclude someone from working. In fact, the leader holds a day time job. One of the highlights to our discussion with him was when we asked his opinion on the dynamic with Jews and Muslims. He responded that his wish is for everyone to live in peace and happiness. Religion should be kept from wars and heat, instead individuals should be on the side of conviction and love so that everyone can reach G-d all together. Every human should love each other. For all civilization on earth should live in peace and love. G-d is generous, giving things to humans, why don’t we all share? He further expressed that people have a tendency to keep things they do not need. If people followed this premise it would alleviate war and poverty. Only mankind makes mistakes – we should spend more time loving our neighbor. 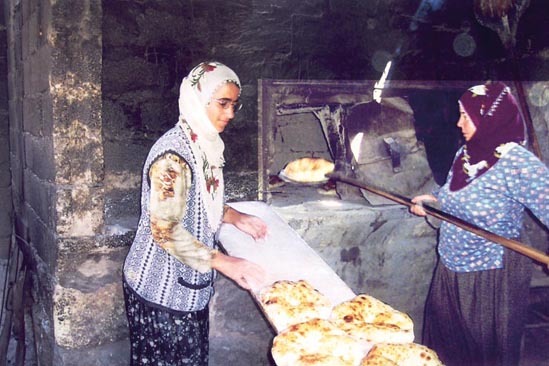 It was a trip I dreamed about for nearly 40 years, the return to Ulas, a small village in central Anatolia that I called home for two years of my life. I was in the Peace Corps, from 1965 to 1967 and worked as an English teacher at a Turkish middle school. In June of 2005, I returned to this remote village of 3,000 people with my wife, son, future daughter in law and my daughter. We had all spent almost two weeks traveling from Istanbul and the Aegean to Cappadocia but we could not have been more excited to enter this village. As apparent strangers we created a stir among the people in the center of town. In fact when our brand new minivan first stopped, a frightened elderly lady actually hid behind a wire fence. Within moments I was surrounded by a small group which grew to over 20 people in no time. We spoke mainly in Turkish with a little English that one of the men understood. The older folks soon remembered me as an American teacher who now had white hair. Some recalled that I acquired a generator so that the village could have electricity. There were even some former students of mine. Ulas had changed so dramatically it was hard for me to get my bearings. Where were the seven small adobe brick stores that made up the center of town? How about the wide open spaces between houses, the outdoor plumbing, and a tree lined lane adjacent to the stream where the women would wash their clothes? There were now multi level homes, many more shops and modern amenities. The people were just as friendly and sharing as I recalled even though it was obvious they just got by with the basic necessities. We were invited to their homes for meals and treated as honored guests. As we were escorted around town I met other former students, was taken to my former home that was now the Post Office and kept being addressed by my former title…teacher. The visit to Ulas was one of the many highlights of our trip. Turkey is truly a travel destination that combines the best features of any vacation. Any concerns one may have about visiting a Muslim country are totally unfounded. While many Turks may object to the current US foreign policy, we still felt welcomed as Americans. Turkey has also been one of America’s staunchest allies, was one of the first countries to recognize Israel, and has been a haven for persecuted Jews over the ages. Turkey has fought against many terror groups for years and is unrelenting against those who wish to instill fear, hatred and discrimination. The Turks were outraged when synagogues were terror targets. This is a country we should support in so many ways, tourism being just one of the more delightful ones. one of the mostamazing and popular touristites in Turkey. 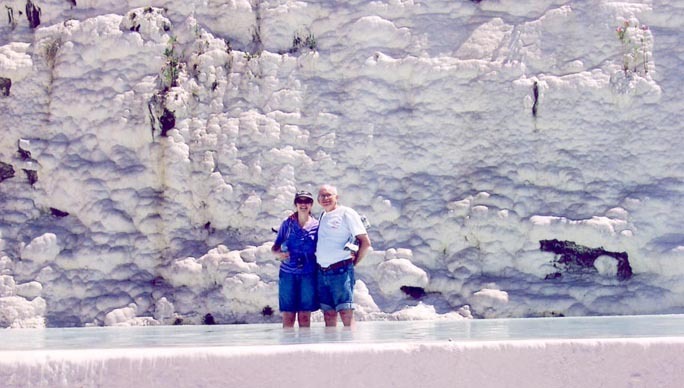 The spectacular mineral ponds in Pamukkale. View of library and streets of Ephesus.